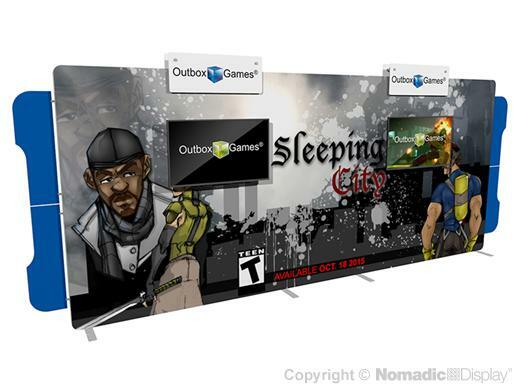 Do more than show up, make a stand out statement with an Envision exhibit wall! With its big graphic impact in an elegantly contoured edge-to-edge finish, Envision tells passersby that you’re a top quality company. Mix and match or rearrange add-ons including halogen or LED lights, dimensional graphic signage for interchangeable messages, monitors to display engaging content and more! Tool-free frame assembly makes set-up fast and easy with pre-installed thumb screws so there are no loose parts to lose. The seamless SEG (silicone edge graphic) fabric-printed panel is lightweight, durable and machine washable. Envision displays ship via UPS and FedEx and are backed by Nomadic’s industry-leading Lifetime Warranty. 2 - RollOne Case - 42" x 26" x 22"